Captain Marvel continues to clean up on box office success. It has already amassed $773 million worldwide and should make even more as this forthcoming weekend arrives. But an interesting story regarding the inspiration of the Skurlls’ design from the film has emerged from one of Marvel Studios’ own. Jackson Sze, who serves as a senior visual development artist for the company, recently provided two new images and a story on Instagram. In it, he explores the personality of Talos, one of the key Skrull characters in the new Marvel film. You can see the full post and the attached images below. It’s a neat idea that potentially leads to the iconic look that Samuel L. Jackson provided for the character over the past few years. Now the real question is where Fury’s fate goes from here. The fate of his character is still unknown for Avengers: Endgame after what unfolded in Infinity War. We’ll find out for sure when the movie opens in a few weeks, on April 26. You can check out more of Sze’s Instagram channel here. It includes pieces of promo materials from Captain Marvel, but there’s some original artwork as well. 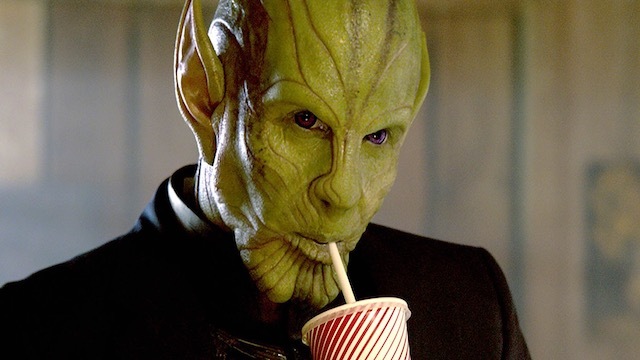 What do you think about this Skrull artwork? Let us know in the comments below!